Florida start-up entity BAD MOMS, LLC beat the producer of the movie with the same name to the punch! Specifically, the company sued the producer for declaratory judgment and an injunction preventing the movie producer from using the mark in connection with any of the Florida company’s goods and services or those related thereto. Both parties have pending applications for BAD MOMS and related trademarks. The lawsuit came after the movie producer sent demand letters to the Florida entity asking it to abandon its applications for BAD MOMS trademarks and cease using the mark. The movie producer brought counterclaims against the start-up company. The Florida start-up company was founded by a single mom working her way through college and law school. The company organizes and hosts events for single-moms to share experiences, provide education and create a network. In addition, the company sells wines and spirits under the BAD MOMS mark. Earlier this month, the dispute heated up when the movie producer asked a federal judge to sanction the start-up company for failing to follow a discovery order. The attorney founder of the company denied that the motion is warranted and asked for an extension of time to respond to the motion. The Court granted her request. The hearing on the motion is scheduled for Monday, October 29, 2018. 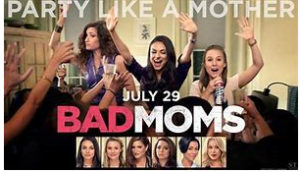 I have not seen the “BAD MOMS” movie but it was popular enough to spawn a sequel. Many of my friends told me it is a fun movie to watch, even if it is predictable. I heard that the following movie scenes were hysterical: (1) grocery store scene; (2) limping dog scene and (3) the meeting to discuss the school board. We will have to wait to see who wins the lawsuit and if the trademark dispute spurs more interest in the movies and/or the Florida company’s events and products.